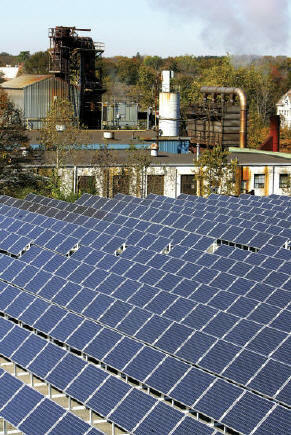 Brockton, Massachusetts, is home to the largest brownfield to brightfield project in the United States, which saw the installation of a 465-kilowatt solar generation facility on a former toxic waste site. a blighted area and former Superfund toxic waste site and turned it green with the installation of a 465-kilowatt solar-generation facility. The transformation from brownfield to brightfield is the largest project of its type in the nation, says Lori Ribeiro, a brownfield consultant who worked with the city as the project manager. "The city leaders were very, very excited about this project, because it took idle blighted land and turned it into an asset that was productive," she says. Since its dedication little more than a year ago, the project has received national accolades and attention as an example of how to transform an environmental liability into an asset. But Ribeiro admits it wasn't without challenges, such as securing financing, amending state law to allow the city to operate an electrical generation facility and working around the cap over the waste site. In fact, the original plan drafted in 2000 called for the project to be developed in two phases. The first phase involved 3.7 acres and the roughly 500 kW photovoltaic installation. The second phase involved about five acres of usable land directly across the road from the first site and a similar-sized PV installation. The city is not actively pursuing Phase 2 because of the challenges encountered when it sought financing of the first project, Ribeiro says. But she says that might change, depending on what happens with Governor Deval Patrick's efforts to make his state the "clean energy capital of the world." Massachusetts currently has about two megawatts of solar electricity generation, and, ambitiously, Patrick says he wants to increase that to 250 MW within the next 10 years. The term "brightfield" was coined by the Clinton Administration to describe projects that meet three criteria: They must involve cleaning up a brownfield site; they must attract PV-product manufacturing and accompanying jobs; and they must involve installing solar-generation panels on the site. Chicago boasted the nation's first brightfield in the late 1990s with the establishment of the Spire Solar Chicago PV manufacturing plant. But parent company Spire Corp. eventually relocated the plant to its Massachusetts headquarters. With 465 kW of solar-generated electricity, the Brockton brightfield is the nation's largest and meets the three criteria. The solar manufacturing component involved Schott Solar Inc. in nearby Billerica, Massachusetts. The Brockton brightfield sits on the former Brockton Gas Light Co.'s gas works site, which is now owned by Bay State Gas of Westborough, Massachusetts. Waste coal tar and ash that had accumulated since the 19th century prompted the U.S. Environmental Protection Agency to declare it a Superfund site. During the 1990s and through early 2004, Bay State Gas, which had purchased the property, performed remediation on the site. Final remediation involved capping materials about 18 inches below the surface. Under an arrangement, Bay State Gas retained ownership of the land, but leased it to the city for 30 years. The city of Brockton conducted a feasibility study of the site in 2000. Because it was a former brownfield, Ribeiro says the city was barred from using it for houses or a park and was limited in how it could develop it. Solar seemed to fit best, although it had some inherent drawbacks. "It was a solar project, and solar is the most expensive form of electricity," Ribeiro says. "Generally, it's only cost-effective when there are rebates. But in the case of this property, there really was nothing else you could do with this, so it was ideally suited." Although many of the neighbors initially were leery of the project, fearing it would reflect too much glare or worsen an already blighted area, Ribeiro says they quickly became supporters once they learned of the project's details. Securing financing was a challenge, since the city was navigating uncharted waters, Ribeiro says. 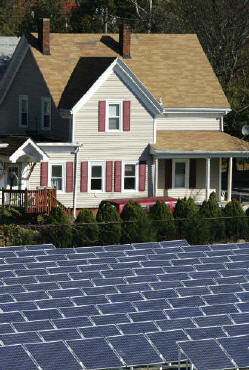 Lenders also were wary of the project, because of solar electricity's costs compared with conventionally generated power. The city received a $1 million grant from the Massachusetts Technical Collaborative's Renewable Energy Trust. Of that, $840,000 was an installation grant, says Emily Dahl, public information officer for the collaborative. The remaining funds are from the collaborative's agreement to buy renewable energy credits associated with the project. Although the trust fund helps underwrite mostly smaller projects, Dahl says fund officials supported Brockton's efforts because of its unique benefits. The city also received a $789,000 Department of Energy grant. The remaining funds came from $1.6 million of city-issued bonds. Despite successfully securing funding, Rubiero says the city still had to overcome state law that barred communities from financing or operating energy-producing facilities. In 2004, Brockton filed a Home Rule petition in the Legislature, seeking such authority. But the proposal died in January 2005 for lack of a vote. Undaunted, the city later that year sought special legislation that would allow it to proceed with the solar project. Then-Governor Mitt Romney signed the special law, paving the way for Brockton to issue a request for proposals and eventually award the contract. Global Solar Energy Inc., whose integrated systems business unit has since been purchased by SOLON America Corp. of Tucson, Arizona, was the general contractor on the project and coordinated the different firms and suppliers involved. But Tim Westover, SOLON vice president of sales and engineering, says it was "very much a total team effort" with Landerholm Electric Co. of Brockton, the general contractor for the project. Brockton's solar system has a total of 1,390 modules from Schott Solar. The panels were mounted as a fixed tilt system at a latitude for optimum year-round performance. In developing the project plans, Ribeiro says the engineers had to maintain the integrity of the cap that was 18 inches below the surface, as well as assure the site was aesthetically acceptable to the local residents. "We used several hundred yards of compacted crushed concrete put on top of that and added an extra layer of soil, so when we installed the solar panels, we could anchor them 18 inches deep," she says. The contracting firm J. Derenzo of Brockton was responsible for site development and used about 6,000 cubic yards of concrete to create an 18-inch-thick platform on which to install the solar panels. Working around a cap on a brownfield was a new experience, Westover says. "With a typical ground mount, we consult a structural engineer to make sure the mounting system uplift load requirement is met by the anchoring system," he says. "For Brockton, we also had to make sure the structural system would meet the load requirements, and then, based on the anchoring system depth Colar and Colantonio Inc. of Norwell, Massachusetts., the project's environmental engineer, reviewed the predesign plans as well as each step throughout the actual job. The firm also worked closely with everybody to ensure they understood the cap location and to ensure that state water and drainage system requirements were met. 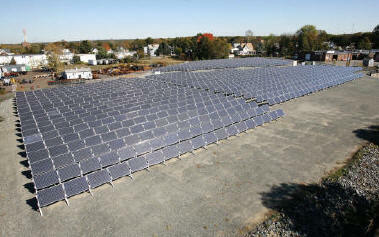 Brockton's solar system relies upon 1,390 ASE300 310-kW modules from Schott Solar. The panels were mounted as a fixed tilt system at a latitude for optimum year-round performance and had to withstand winds of more than 80 miles per hour. Not only did engineers have to consider sun angle when determining panel placement, but they also had to ensure Bay State had access to monitoring wells and other testing maintenance sites, Ribeiro says. A power converter system from Satcon Technology Corp. of Boston converts the direct current to alternating current, and Fat Spaniel Technologies of San Jose, California, supplied the data acquisition and monitoring systems. As part of its general contracting responsibilities, Landerholm Electric Co. installed the entire solar system, including solar panels and other electrical equipments to connect to the utility grid. Landerholm also is responsible for the solar system maintenance and operations, and is responsible for facility security. Landscaping surrounds the fence that encloses the panels. The site features a learning plaza that several local teachers already say they plan to use as part of field trips to teach students about solar energy, pollution and the environment. Constellation NewEnergy of Baltimore, Maryland, has agreed to buy the anticipated 535 megawatts of electricity generated annually for about $130,000 each year. The project was designed to be revenue neutral, so the generation revenue as well as proceeds from sales of the renewable energy credits will fund bond repayment and maintenance and operations, Ribeiro says. Because Brockton is an economically distressed area, she says city leaders would never have supported a project that would have required continual financial support. Despite the few speed bumps encountered along the five years it took the project to come to fruition, Westover's opinion no doubt mirrors those of others involved. "It turned out to be a very, very good project, but it was a little more complicated than we had anticipated," Westover says. "But it all worked out. "It was our first brownfield project, but we think we are well experienced to do more. We think it's a great opportunity for land use."